service at my office, or a mobile lab service to come to the location of your choice. clearly explain the evaluation and valuation process. indicate the intended use of the appraisal. be performing on your jewelry item. I explain the evaluation and valuation process as I am conducting it. I walk through the process with you step by step - While You Watch. It's important to me that you understand how and why I arrive at the value conclusion. I am happy to answer any questions you might have during the appraisal process. 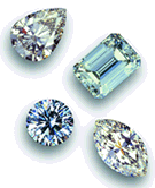 All diamonds over half a carat will be issued a diamond grading report. stone. If your stone un-mounted, it is directly weighed on a digital carat weight scale. The weight is noted in the report. noted in the final report. Finish: Symmetry and Polish will be assessed and given a grade of Poor to Excellent and noted in the report. Cut Grade: A cutting class is assigned based on the stones cutting proportions and is noted in the report. Hearts & Arrows and Light Return ASET images are included in each report. All colored stones over one carat will be issued a colored stone grading report. Tone: The degree of lightness or darkness of the color of the stone is evaluated and noted. your stone. If your stone un-mounted, it is directly weighed on a digital carat weight scale. The weight is noted in the report. Cut Grade: The cutting class based on the stones cutting proportions is evaluated and noted in the report. Finish: Symmetry and Polish will be observed and given a grade of Poor to Excellent and noted in the report. Inscriptions, hallmarks, karat stamping's, signatures and any other identifying markings are noted. are estimated using the appropriate formulas. The findings are noted in the report. Custom design and hand fabricated work, along with signed pieces are noted and taken into account in the final value conclusion. All the quality analysis information listed above is conveyed in a clear and easy to understand format in the final appraisal report. Digital Photographs of all jewelry items are taken and included in the appraisal document. Your appraisal report will explain the grading system used. The appraisers certification of practice is included and the report is signed by the appraiser. Your appraisal will be prepared in conformity with the Uniform Standards of Appraisal Practice, USPAP. The final appraisal report is a folded booklet that comes in a protective vinyl pouch with one extra copy. Protect your investment with the GemSecure Jewelry Appraisal - Complete Assurance.